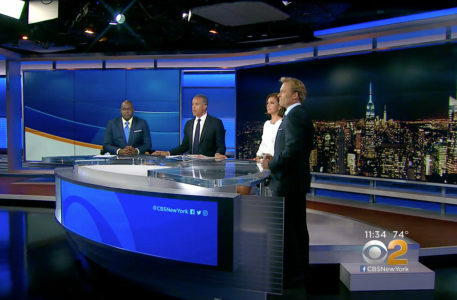 CBS’s flagship O&O WCBS in New York City unveiled its new home Thursday, Sept. 14, 2017 — a debut date that coincided with its sister station in Chicago. The set, from Broadcast Design International, is designed to continue the branding updates at other CBS O&Os, including Los Angeles’ KCBS, WFOR in Miami, and KOVR in Sacramento, in addition to Chicago. 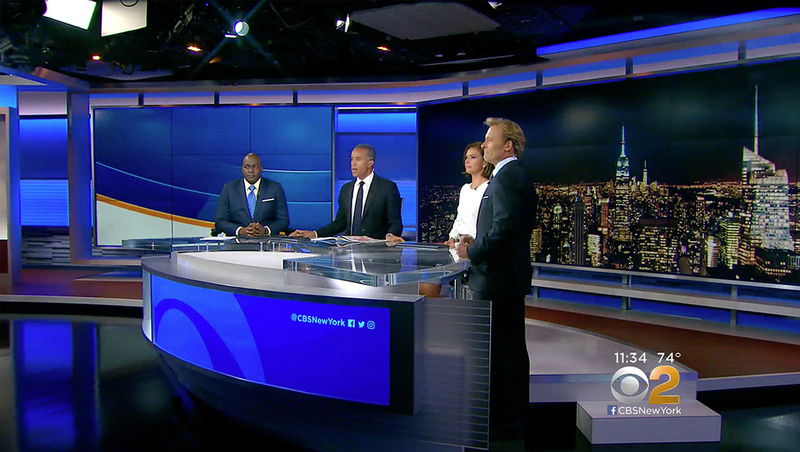 The half circle anchor desk is placed so that the studio’s two video walls, which use the 55-inch Snello line from Primeview, allowing it to be used cityscape and topical backgrounds as well as live shot tosses and standups. The desk itself is equipped with a curved 1.9mm Design LED ribbon. On the right side of the set, a 2×3 vertical video wall can be used to show the ring-shaped elements from the CBS O&O graphics package as well as branded and OTS graphics. The set also includes a weather center with 84-inch touchscreen and 65-inch vertically mounted panel that is also used for social media and traffic segments. This area is also equipped with a 2.5mm LED band and an angled lectern-style pod. In addition the metal toned frames to ground the design, the set also includes wood risers and a low stacked stone knee wall accent with an interview area to the left of the anchor desk. Perhaps most notable, however, is the elegant lighting design from Dennis Size of The Lighting Design Group, which results in a deeper, richer color palette.